Anatomy, an international journal of experimental and clinical anatomy, is a peer-reviewed journal published three times a year with an objective to publish manuscripts with high scientific quality from all areas of anatomy. 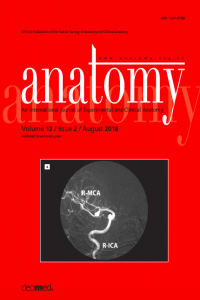 The journal offers a forum for anatomical investigations involving gross, histologic, developmental, neurological, radiological and clinical anatomy, and anatomy teaching methods and techniques. The journal is open to original papers covering a link between gross anatomy and areas related with clinical anatomy such as experimental and functional anatomy, neuroanatomy, comparative anatomy, modern imaging techniques, molecular biology, cell biology, embryology, morphological studies of veterinary discipline, and teaching anatomy. Anatomy is currently indexing and abstracting in TUBITAK ULAKBIM Turkish Medical Index, Index Copernicus (ICV 2017=86.99), Proquest, EBSCO Academic Search Complete and Google Scholar. Anatomy is the official journal of the Turkish Society of Anatomy and Clinical Anatomy (TSACA). Anatomy is the official journal of Turkish Society of Anatomy and Clinical Anatomy (TSACA).